Most people think of honey as an alternative sweetener to sugar. However, honey has been used for centuries in folk and traditional medicines as a healing remedy for a number of physical and mental complaints. Honey is reported to have antibacterial, pain relieving and sedative properties, according to author Nathaniel Altman in his book, "The Honey Prescription." Some alternative healers believe that honey may even help alleviate anxiety. Anxiety is a common mental health problem. According to the National Institute of Mental Health, anxiety disorders affect about 40 million American adults yearly. Anxiety results in troublesome symptoms that can interfere with your ability to function, including insomnia, appetite loss, irritability, constant worry, nervousness and unexplained aches and pains. While conventional treatments, such as psychotherapy and medication, often bring relief, some turn to alternative and holistic remedies in the hopes of avoiding some of the negative side effects associated with medication. Some treatments that may provide benefits include relaxation techniques, exercise, dietary changes and herbs, according to the University of Maryland Medical Center. Some folk and traditional medical practitioners also suggest that certain foods, such as honey, may have anxiety-relieving properties. Honey's therapeutic properties have been understood by traditional Chinese healers for centuries. However, Western culture is only just beginning to study the benefits of honey for physical and mental ailments. A review published in the November 2002 issue of the "Journal of Wound, Ostomy and Continence Nursing" suggests that honey may have antibacterial, anti-inflammatory and immune response-enhancing properties. According to Altman, Ayurvedic practitioners in India use several varieties of honey for treating conditions associated with a dosha imbalance or a deficiency or excess of certain qualities in your bodily composition. In fact, Ayurvedic medicine suggests that honey is one of the foods that can increase feelings of mental balance, says Ayurvedic practitioner Robert Svoboda in his book, "Prakriti: Your Ayurvedic Constitution." Additionally, honey may have antioxidant properties that can have a beneficial effect on anxiety levels, according to Lynne Chepulis in her book, "Healing Honey." Honey is a common remedy for insomnia, one of the main symptoms of anxiety. In fact, the University of Cambridge Counseling Service suggests eating bread with honey or drinking warm tea with honey before bedtime to alleviate anxiety. While further studies on human subjects are needed to confirm the benefits of honey for anxiety disorders, one study, published in the June 2009 journal "Physiology and Behavior" by researchers at Waikato University in New Zealand, studied the effects of honey, sucrose or sugar-free diets on anxiety and memory in laboratory rats. 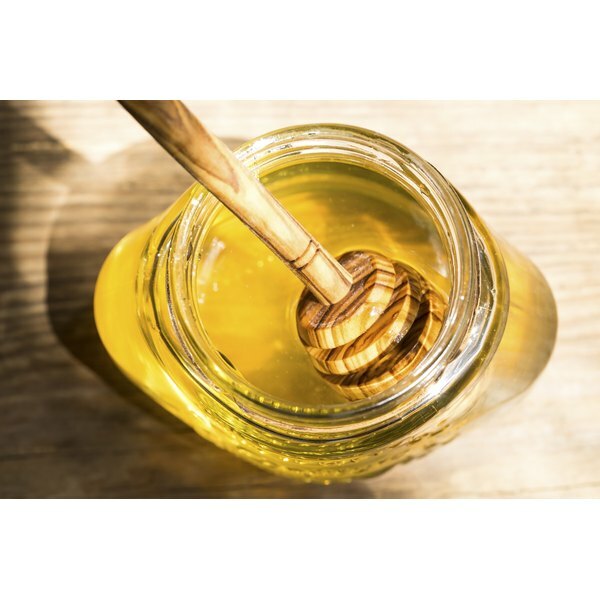 The findings suggest that honey may have a beneficial effect on anxiety and memory, although additional research is needed to support this claim. The benefits of honey for anxiety are not fully confirmed by scientific research. Most of the evidence that honey may decrease anxiety is anecdotal, based on folk and traditional uses. Honey is not a cure for anxiety. In fact, eating too much honey or any simple sugar may exacerbate levels of anxiety, according to psychologist Edmund J. Bourne in his book, "The Anxiety and Phobia Workbook." Consult your doctor if you think you may have an anxiety disorder.